ANTIASTHENIC COMPLEX FOR FREQUENTLY ILL AND DEBILITATED CHILDREN OLDER THAN 1 YEAR! Cardonat is a unique2 combination of carnitine, lysine and B vitamins in their coenzyme form. It normalizes metabolic processes and exhibits neuroprotective, cardioprotective and hepatoprotective effects. Cardonat facilitates the elimination of asthenia symptoms during and after infectious and somatic diseases; promotes fast recovery3! Cardonat is a unique2 combination of carnitine, lysine and B vitamins in their coenzyme form. It normalizes metabolic processes and exhibits neuroprotective, cardioprotective, hepatoprotective effects. 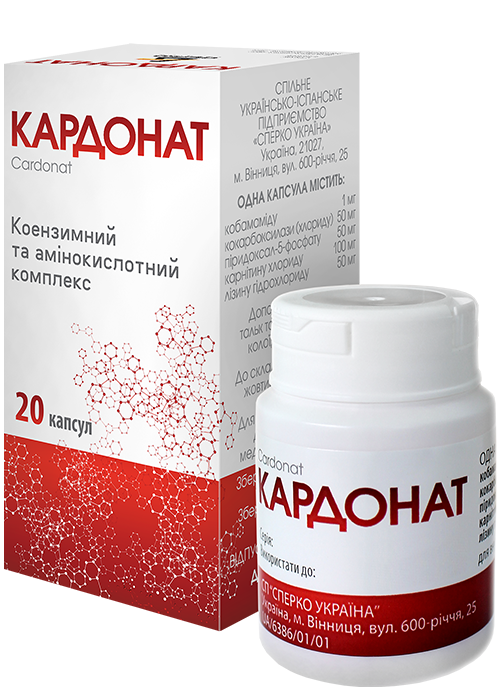 Cardonat facilitates the elimination of asthenia symptoms during and after infectious and somatic diseases. Cardonat is a unique combination of amino acids and B vitamins in coenzyme forms. Carnitine chloride – 100 mg, Lysine hydrochloride – 50 mg. Adults and children: physical and mental overexertion, decreased capacity for work, vegetative-vascular dystonia, acetonemic syndromes of different genesis, hepatic disorders (hepatitis, cirrhosis), metabolic cardiopathy, chronic heart failure (as a part of the complex therapy), improvement of ossification as a part of the complex therapy of osteoporosis and bone fracture. Children: delay in physical and mental development (hypotrophy, anorexia, growth inhibition). Adults: peripheral neuritis, neuralgia, radiculopathy as a part of the complex therapy of acute and chronic disorders of cerebral circulation (cerebral strokes and chronic cerebral ischemia), as a part of the complex therapy of ischemic heart disease (stenocardia, myocardial infarction), hyperhomocysteinemia, as a part of the complex therapy of alcohol dependence syndrome including abstinence syndrome and hyperthyroidism. Cardonat provides a number of therapeutic benefits due to its complex composition and synergistic effect of its ingredients. Carnitine is an amino acid that acts as a unique carrier of fatty acids to mitochondria cells, stimulates lipolysis and facilitates energy supply to cells. It decreases symptoms of fatigue and general weakness, rapid fatigability, overexhaustion in the morning4 and improves exercise performance. It exhibits cardioprotective activity – stabilizes cardiomyocytes, prevents damages in cardiomyocytes. B group vitamins are essential components that play a role in the most metabolic processes. The neuroprotective effect – B group vitamins catabolise neuromuscular processes of impulse transmission, stimulate release of neurotransmitters in synapses, enhance glucose uptake and ensure nerve tissue tropism. They restore nervous system function. B group vitamins are provided in a coenzyme form. Coenzyme Vitamin B1 (cocarboxylase) regulates metabolic processes in the body. It reduces the level of lactic and pyroracemic acids in the body, improves glucose uptake, nerve tissues tropism and exhibits cardioprotective action. Coenzyme Vitamin B6 (pyridoxal-5-phosphate) plays a key role in metabolism regulation essential for proper functioning of the central and peripheral nervous system. It acts as a coenzyme for different enzymes; catabolizes neuromuscular processes especially important at an early age in children with a delay in physical and mental development, chronic fatigue and asthenia. Coenzyme Vitamin B12 (cobamamide) has anabolic activity, activates metabolism of carbohydrates, lipids and proteins. Cobamamide promotes normalization of liver and nervous system dysfunction, activates coagulation system; in high doses it leads to increasing thromboplastin and prothrombin activity. Lysine is an essential amino acid. It is involved in the processes of ossification, stimulates growth of bone tissues. For detailed information on the medicinal product Cardonat, please see “Package leaflet” page. 1 The term “frequently ill and debilitated” shall be understood to mean in the recovery periods after prior diseases. 2 The term “unique” shall be understood to mean a single medicinal product registered in Ukraine with such composition in the group with АТХ А11 code (oral forms) as of October 2017. 3 Information letter about new changes in the public health system No.332-2016. 4 The indicated symptoms are symptoms of asthenic syndrome.